I saw Masque Theatre's summer show on the second Friday and chose an ideal evening – warm and still sunny. This year, director Rob Kendall was presenting one of Shakespeare's most patriotic plays, Henry V.
Judiciously cut by Rob and therefore nimble and pacy, all the prime elements of this spirited and passionately-played production were in place. Henry's two magnificent speeches (‘Once more unto the breech’ and the St.Crispin's Day rouser) were there and given full weight by Scott Bradley's compassionate, steely and witty Harry. I always measure the strength of the actor playing the king if I feel as though I would follow him into battle – glad to relate, Scott managed it and then some. There was a terrific supporting cast to enjoy too. I particularly liked Mark Farey as Chorus, urgent and persuasive, Simon Rye (Exeter), so good when fiercely admonishing the three traitors and Barry Dougall (and leek!) as the loyal and bold Fluellen. The scene between the French princess, Katherine (Lasma Paberza) and her lady in waiting, Alice (Beverley Webster) was a delight, sweetly and lightly comic. A notice advised us that Bardolph would be played by busy Rob Kendall and I later learned that Owen Warr who had been playing the part up until Wednesday, had had a fall and broken a wrist. What a shame; I can well imagine what comedy and pathos dependable Mr Warr would've brought to the role, but kudos to Rob for playing it without referring to a script. And with a lovely red nose, too! Can I finally applaud the costumes, from the crowns to the cassocks. I shall never tire of the idea of knitted chain-mail – no wonder we won! So, a joyful version of one of my favourite Shakespeare plays – well done to everyone involved. A triumph. Huzzah! 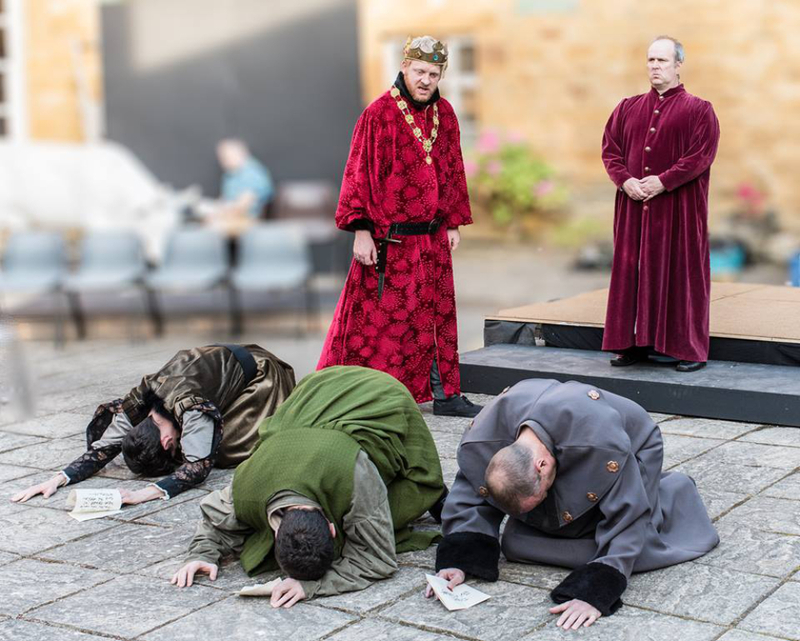 'Once more unto’ the courtyard for Henry V - this year’s open-air summer production. It is, in part, a celebration of William Shakespeare’s 400th anniversary in April of this year. That's also when Masque Theatre contributed towards the mulberry tree planting organised by the Royal & Derngate Theatre. 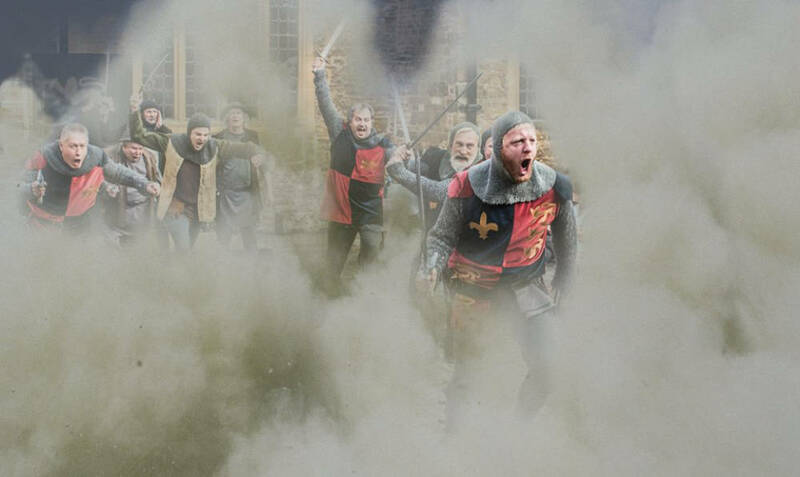 But is also a year on since the 600th anniversary of the actual Battle of Agincourt, which features in the play, and we hope to re-enact in the courtyard! Masque Theatre performed Henry V some 40 years ago, also in the courtyard of the museum (with John Lott as Henry), and those of you of a certain age who saw it will remember the battle scenes, particularly when some of the swords and cudgels came perilously close to the audience! Needless to say no ‘real’ lives were lost and it with great pleasure that we are able to perform the play again, and we even have one actor in our current production who was a mere youth over 40 years ago. Scott Bradley is playing the title role. Scott was originally a Masque Youth Theatre member and also played roles in the adult group including Mercutio in Romeo & Juliet (2011 and 2001), and Oberon in A Midsummer Night's Dream (2009). He also appeared as Herbert Pocket in Great Expectations (2010). A cast too big to mention all by name but not the least of the ‘stalwarts’ being Mark Farey as Chorus and with Owen Warr; Tony Janney; Kevin Pinks; Barry Dougall as Fluellen and Roger Toone as Pistol will give you something of the flavour of the piece. For the French court, we also have Lasma Paberza (also the French princess in The Lion in Winter) as Katherine, Beverley Webster as Alice, Jan Stoppani as Queen Isabel, Harry Ferry (Prince John in The Lion in Winter)as the Dauphin and Victor Guse as the French King. All this is in addition to a full supporting cast and stage management. In essence, the clue to the plot is in the title and the play traces the trajectory of Henry's initial Kingship towards the establishment of rule and reign, with the French wars. The play, though, is more than a patriotic bashing of the French and is as much about personalities and characters as well as a nod in the direction of his younger rebellious days with the Falstaff crew and there is much ado with a leak (ask Barry and Roger). Given that recent television is happy to borrow one line ‘We band of brothers’ as a hook to get everyone watching make sure that you do too and come and see our period costumed production. Oh - and don’t be afraid to cry out ‘huzzah’ once more!